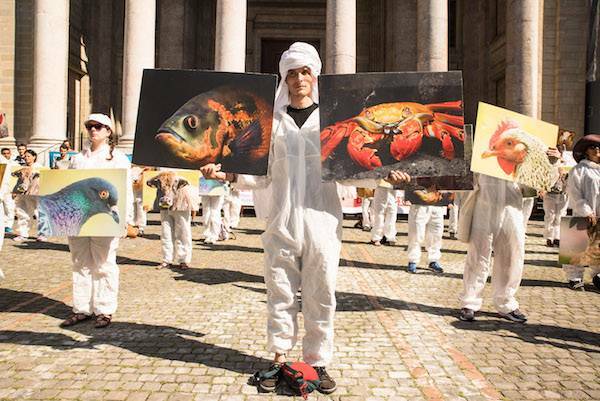 For the second consecutive year, the association PEA (Pour l'Egalité Animale) organized a large demonstration in Geneva. This time on Saturday the 27th of August, the Worldwide Day for the End of Speciesism. According to the official website, "by analogy with racism and sexism, speciesism refers to an ideology that considers the lives and interests of animals as insignificant just because they are of a different species. " In this context, a letter was delivered to the United Nations requesting that its Economic and Social Council integrates the issue of respect for animals in its specific recommendations. Impressive happenings took place in the city of Geneva. 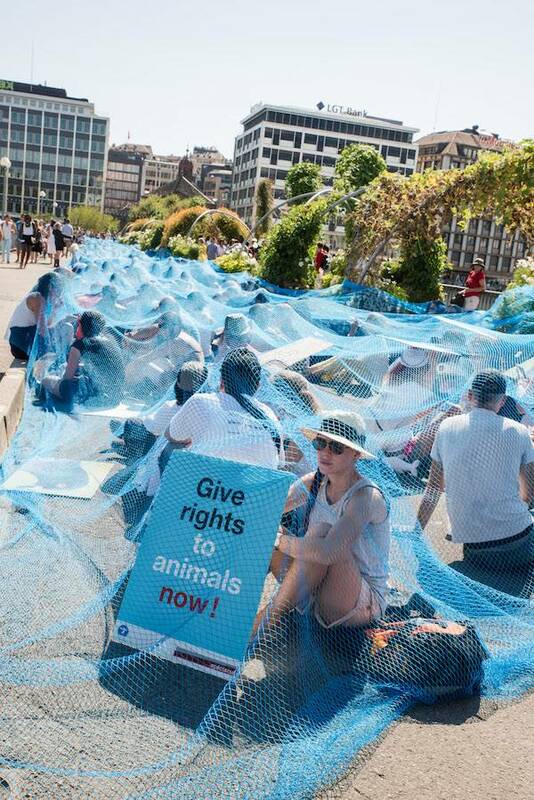 On the bridge of Bergues, all the protesters lay on the ground and were covered by a huge fishing net. Everyone would be shocked if someone caught hundreds of birds in a net and then killed them by drowning them in water, yet it this is exactly what fishing is for the aquatic animals. Fish cannot cry out to express their suffering, but this does not make their suffering and death any less terrible when they die by suffocation in fishing nets. We need to stop this violence and expand our circle of compassion to all sentient beings. It should no longer be allowed to kill animals just because they are a different species to us. Similar actions took place simultaneously in other cities around the world, notably in Montreal, Toronto, Paris, Lyon, Nice, and in Poland, Argentina, Ecuador, New Zealand, etc. For this event in Geneva, about 1,000 demonstrators were present. According to the spokesperson Malena Azzam, "we need to move towards a world where we consider the lives and interests of all sentient beings." 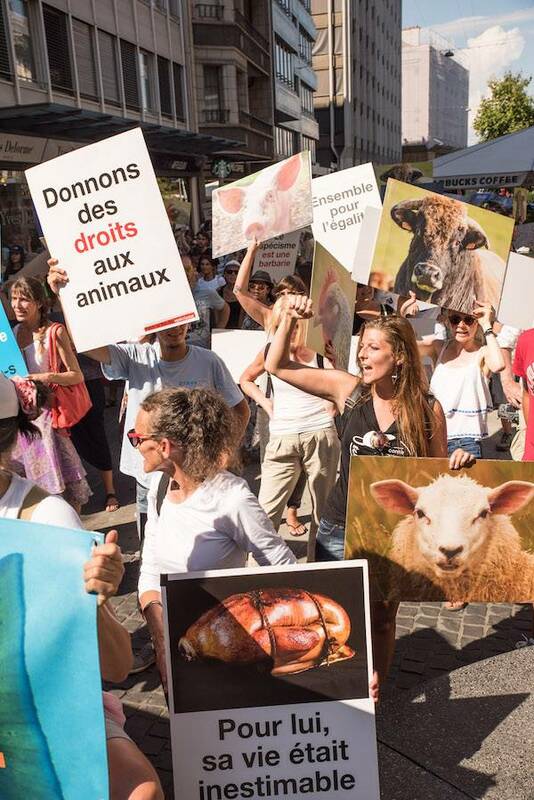 Organized by the Association PEA – (Pour l'Egalité Animale - For Animal Equality), this march was made “to include animals within the circle of our moral consideration” (see the demands here). According to the spokesperson Malena Azzam, "animals are still considered simply as a resource. Killed for clothing or food, instrumentalized for experiments, bought and sold like common merchandise. This has become unjustifiable since we know that they also feel emotions and have a mental life. Today, ethologists invite us to see animals as full individuals with preferences, desires and personality. It is therefore time to abolish the property status of animals, stop using them as laboratory equipment, finish with slaughterhouses and fishing and take into account all sentient beings regardless of their species." Recent scientific findings show that self-awareness, culture, altruism and the ability to use tools exist in many animals. Conferences discussing animal ethics were held all day Sunday, August 28.